Mba Nining email me and ask for cute blog design for her catering service blog. She want a fresh color and choose orange green color. Not too strong color so I suggest a pastel color as usual. 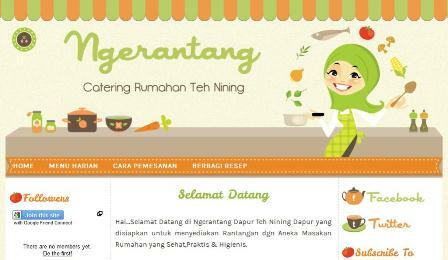 Ngerantang is her blog title, because she thinks that rantang or food pot/pan represent her catering business. how much the price for this website? Can I ask for a free template design? can i ask for free template design ? O my god.. How cute! I want one to for my cooking blog can you make that for me and what is the price? can i have this template for my recipe blog? ?